More and more nowadays, the wealthy are turning to pawn shops for lending services and more. The images of the seedy pawn shop for the down on their luck patrons is becoming a thing of the past in many cases. This is because more and more people understand how pawn shops can be a great resource to them and their needs. In business timing is everything, many times a business owner may find themselves in need of a quick cash loan and not have the time to deal with the lengthy trappings of a traditional bank loan. With high end pawn shops, the customer can quickly obtain a collateral loan with no lengthy forms and credit checks, and with a flexible payment program offering a very reasonable interest rate. Additionally, many affluent customers are turning to pawn shops as a means to obtain quick cash loans against their luxury assets when they’re in need of money for their homes, families or other unexpected emergencies that pop up. Many clients have assets worth high dollar amounts, but are cash poor, and so a pawn shop is the perfect solution for their short term lending needs. Jewelry-N-Loan is one pawn shop that caters to the high end customers looking to sell or get loans on their luxury assets. 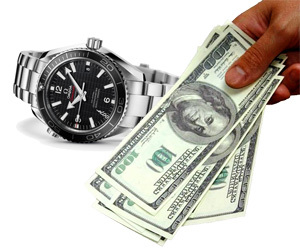 We specialize in short term cash loans made against fine jewelry, watches and other luxury items, and we offer one of the easiest and most reasonable processes around. We are fully licensed and regulated and our reputation as a fair and honest Orange County business is flawless. If you’re in need of a collateral loan against your luxury assets, contact Jewelry-N-Loan today!